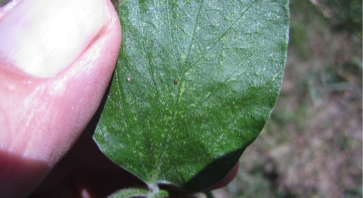 I recently received a phone call from an independent crop consultant who is finding treatable populations of two-spotted spider mites (TSSM) on soybean. I was surprised because I didn’t think our weather patterns would positively impact TSSM populations. However, the field background fits. That is, sandy soil and/or droughty areas where soybeans were moisture stressed. This information is important because it could be a sign of things to come. Or, ……maybe not. However, it does indicate to me that some field scouting for TSSM (and aphids) is necessary. I would suggest spot-checking fields or field areas that you think could be drought stressed. 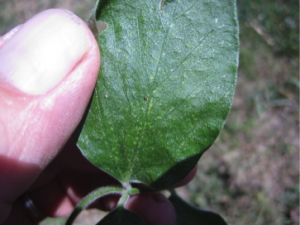 Look for leaf stippling and active mite infestation Use a handlense to confirm. At the same time survey the field for soybean aphids. TSSM control decision can positively impact aphid populations by removing natural enemies. The reverse is also true because aphid control decisions can impact TSSM populations. Choose products which fit your pest populations. General statements that one insecticide class is strong on TSSM but weak on aphids are impossible to make. Read each label and match products and rates for the pest(s) you have. Read the fine print, some labels may have the pest listed but only for suppression. For pests with a high reproductive potential, such as aphids and mites, I want a product that indicates control, not suppression.